In the March 2017 issue, Discover Magazine ran a fake story about America’s supposed declining bee population. One would have thought this tired story would have gone away after bee populations hit a 20-year high and honey production a 10-year high in 2015. But the drive for government cheddar premised on fake crises knows no end. That is the title of a fake science article about the unexplained disappearance of honey bees in America, supposedly a looming ecological disaster requiring immediate government action. We don’t know what that bee keeper from northern Utah might have been referencing, but we do know from the Utah fish and game office that deer are doing quite well in the state, so right there we have our first fake science. Yes, bees don’t live very long, and bee populations decline in the off season every year. 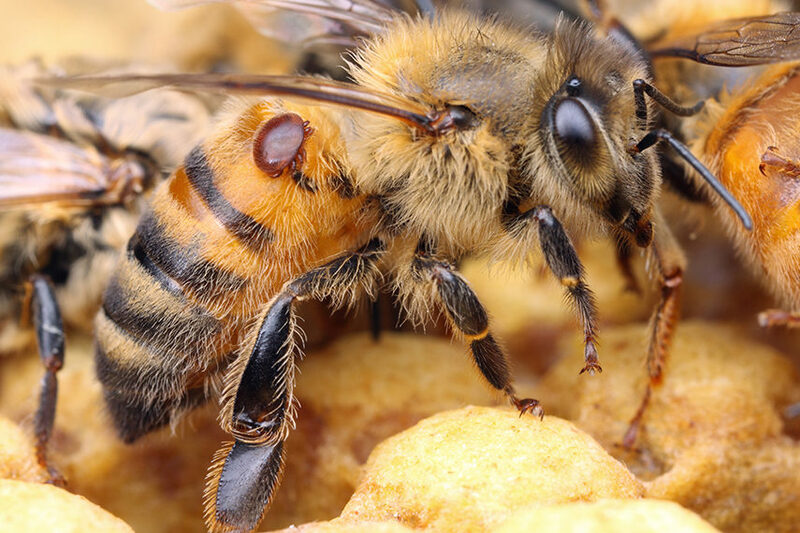 But the author’s use of loaded terms like “deep trouble” and deceptive terminology like “colony losses among commercial beekeepers reach 30, 40, even 50 percent or more annually” belie the reality that bees recover all these losses each new season. It doesn’t take any deep analysis or research to realize this must be the case. If bee populations really declined by 50 percent per year, there would very quickly be next to no bees left, and likely very little fruit in the stores across the country. Yet the stores seem to have more fruit every year. It actually looks like the trouble ended 10 years ago. 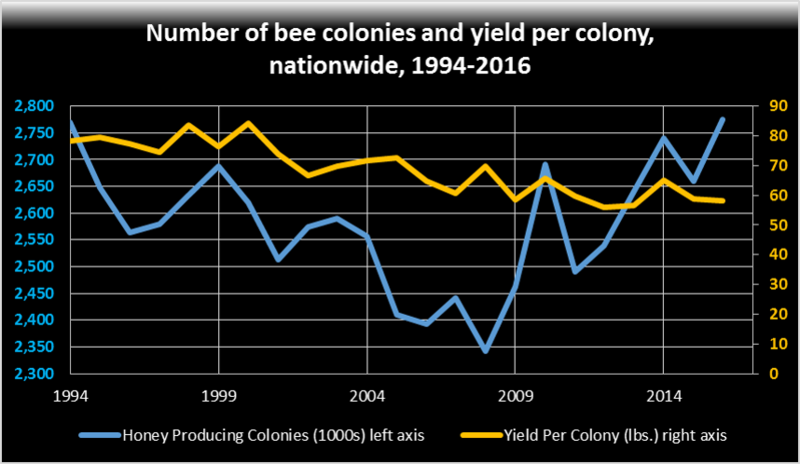 Here we have the official data from the USDA for both for number of colonies and yield per colony going back more than 20 years. The total number of colonies is the highest it has been in more than 20 years. It is true colonies have been getting smaller over time. None-the-less, total production in 2016 161.8 million lbs., well above the 10-year average of 156.9 million lbs. “The problem of declining bee health might actually be getting worse, largely because the factor of agricultural chemicals lies at the nexus of science, finance and politics. Discover Magazine digs up an old, long debunked theory that neonics, class of pesticides phased in during the 1990s, is to blame for declining bee populations. As Discover Magazine points out, the bees pollinate more than $30 billion in crops each year. If this were such a dire catastrophe, with so many $billions at stake, why aren’t the major stakeholders doing anything about the problem? Do they wish to commit financial suicide? Why is it that only retired EPA researchers and obscure documentary film makers seem to care about the problem? It all comes down to who stands to gain from a fake science crises. If it were a real crisis, members of the agricultural sector, whose livelihoods are on the line, would have stepped up to solve the problem years ago. But all we hear from are people involved in the environmental crises perpetuation sector – government agencies, government and university researchers, popular science magazines, and leftists do-gooders of various stripes. The article rambles on in a similar fashion to this one for nearly 1,600 words, all with out every providing a shred of hard data about long term declines in bee populations anywhere in the world, or research affirming a causal link between such declines and neonics. It’s just B*LL$H!T FAKE SCIENCE designed to sell magazines and keep the government funded science racket rolling. This entry was posted in Fake News, Fake Science and tagged bees, colony collapse disorder, Discover Magazine, eco-crisis, environmental disaster by paulmoroni. Bookmark the permalink.